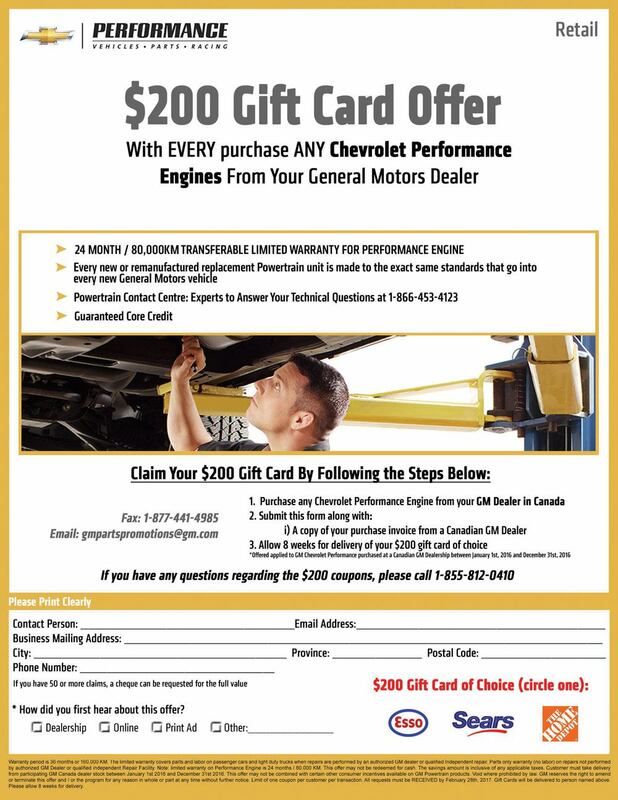 Direct from the Corvette, Camaro, and Chevy SS to your project vehicle! The LS3 6.2L is the 430-hp standard engine in the Chevrolet Camaro SS and the all new RWD Chevy SS. It is a fantastic combination of high technology and uncompromising performance. 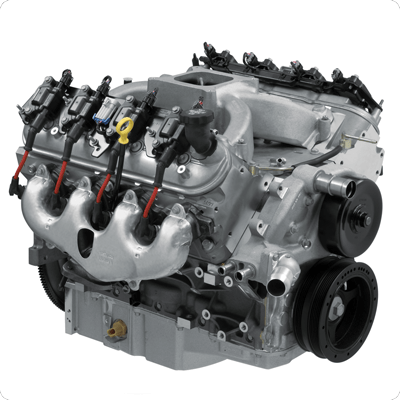 Our LS3 crate engine comes complete, from the Chevy SS-specific oil pan to the ignition system. It also includes the EFI intake manifold assembly with injectors and throttle body, exhaust manifolds, water pump, balancer, 58X reluctor wheel and 14-inch automatic-transmission flexplate. Inside, the LS3 is filled with components designed for high performance and longevity. The aluminum block is filled with a sturdy reciprocating assembly that combines with L92-type rectangular-port heads to deliver a 10.7:1 compression ratio. A high-lift, hydraulic roller camshaft delivers a whopping 0.551-inch of lift on the 2.16-inch intake valves and 0.522-inch lift on the 1.59-inch exhaust valves, enhancing the LS3’s tremendous airflow and broad torque curve. The Chevy SS oil pan doesn’t suit all installation applications. Use a vehicle-specific oil pan for original LS-powered vehicle or Chevrolet Performance’s Muscle Car Oil Pan Kit P/N 19212593 for older vehicles. Our ‘Hot Cam’ Adds 65 HP To The Already-Potent LS3! Our engineers never stop tinkering. When they took a production LS3 6.2L (376 cubic inches) engine and swapped the stock camshaft for the racing-inspired LS Hot Cam (P/N 88958753), the result was a stunning 495 horsepower and 473 lb.-ft. of torque. That’s nearly 12 percent more power and torque from a simple camshaft change! 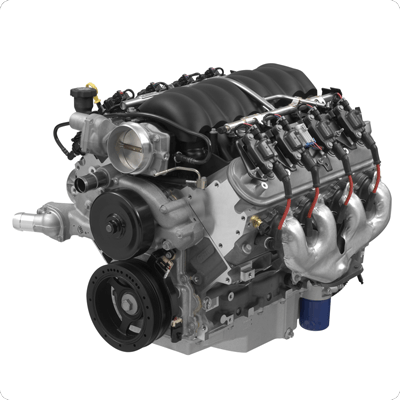 We wasted no time in adding that terrific combination – dubbed LS376/480 – to our crate engine portfolio. The key to the power boost is the Hot Cam’s 0.525-inch lift on both the intake and exhaust sides, along with 219-degree/228-degree duration specs. That’s less lift on the intake side than the stock LS3 cam, but considerably more duration, allowing the valves to stay open a little longer to draw in more air from the rectangular-port L92-style heads. Use the LS376/480 with controller kit P/N 19258267, which includes a special pedal for use with the engine’s electronically controlled throttle. 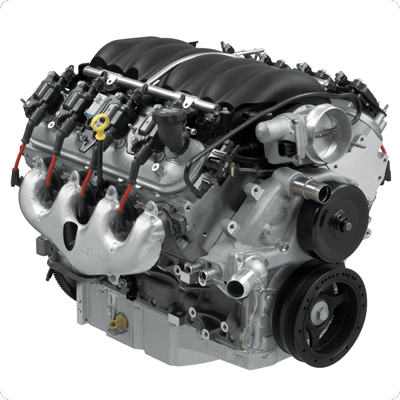 Affordable LS3-Based High-Performance For The Street Or Track! class="x_MsoNormal">Using the LS3 engine as its foundation, the LS376/515 crate engine adds Chevrolet Performance’s racing-derived ASA Hot Cam and a carbureted intake system to produce 533 horsepower at a high-revving 6,600 rpm and 477 lb.-ft. of torque at 5,200 rpm. It’s a great engine for resto-mod classic and late-model muscle cars. The assembly includes a Chevy SS oil pan and LS3 cylinder heads, with high-flow, rectangular-port intake passages, as well as our unique, spider-type carburetor intake manifold. 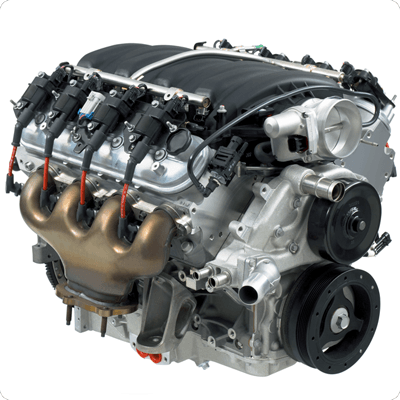 At the heart of the engine is the ASA cam, which extends the performance range of the LS3 with more duration. That means it holds the valves open longer, enabling greater airflow at higher rpm. Wind it out yourself and you’ll see what we mean! What do you get when you take Chevrolet Performance’s aggressive ASA camshaft – developed for the high-rpm world of circle-track racing – and slip it into an LS3 6.2L engine? The answer is 525 horsepower in one of our most powerful production-based crate engines. We call it the LS376/525 and if take-no-prisoner performance is what you’re looking for in your new Camaro or resto-mod Chevelle, this is it! The ASA camshaft is a hydraulic roller with .525-inch lift on both sides, along with 226 degrees duration on the intake side and 236 degrees on the exhaust side. Coupled with a tight, 110-degree lobe separation angle, it helps the engine deliver excellent throttle response and breathe exceptionally well at high rpm. And for durability, we complement the cam with higher-rate valve springs. You’ll need tuning to make the most of the engine in a late-model GM vehicle. If you plan to use the LS376/525 in a vintage car, you’ll need controller kit P/N 19259261, which includes the throttle pedal to match its electronically controlled throttle body. Check out our LS1 Engine Kit Installation Guide P/N 88959384 for details on installing an LS engine in a vintage vehicle. A Living Legend With 427 Classic Cubic Inches! In annals of high-performance engines, the Corvette Z06’s LS7 7.0L will be remembered as a benchmark in naturally aspirated power. It will also go down as one of the most popular LS crate engines ever offered, with 505 horsepower and 470 lb.-ft. of torque. Within its classic 427-cu-in displacement, engineers extracted Big-Block grunt from its high-revving Small-Block package. It features a unique, big-bore cylinder block that is anchored with a forged crankshaft, featherweight titanium connecting rods and friction-coated pistons. But it’s the airflow capability of the cavernous, CNC-ported heads that enables its tremendous power. Large-volume, straight-passage intake runners channel air directly through 2.20-inch titanium intake valves. Chevrolet Performance's LS7 7.0L crate engine package includes a production-style engine with the dry sump oil pan. You’ll need to supply the external oil supply and oil lines to the engine, but the rest of the assembly is fully dressed, including the manifold assembly with injectors and electronically controlled throttle body, and log-style exhaust manifolds. Use our LS7 controller kit P/N 19258553 to get it running in your project vehicle. A classic cubic-inch combination with the latest LS engine technology! With the LSX Bowtie block, we’ve built a 21st century 454 with the latest technology. It’s lighter and more compact than an original Big-Block 454 – while delivering Big-Block output of 627 hp and 586 lb.-ft. – but requires no more space under the hood than a production LS engine. 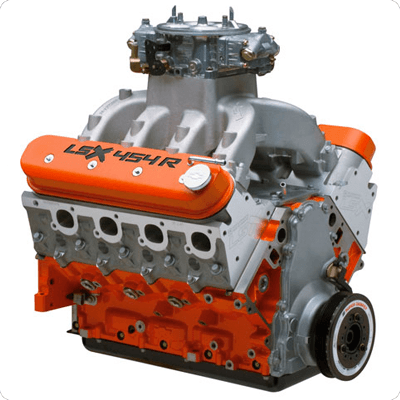 The LSX454 is filled with an all-forged, super-tough rotating assembly and features a pair of our deep-breathing LSX six-bolt cylinder heads. 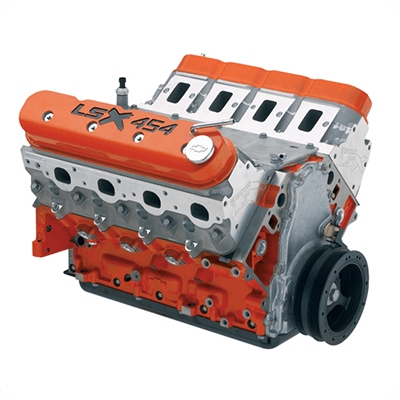 It also comes dressed with great-looking, orange powder-coated valve covers with engraved “LSX454” logos. 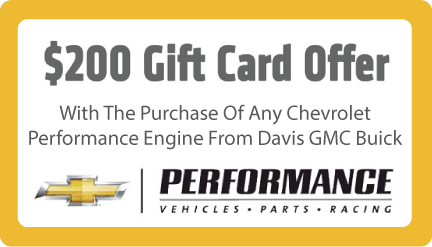 Chevrolet Performance delivers the engine without an intake manifold and other accessories. Use LSX-LS7 single plane carbureted intake manifold P/N 19244033. The LSX454 valve covers do not include provisions for mounting ignition coil brackets. Aftermarket or custom relocation brackets must be obtained. It also includes an 8-bolt crankshaft flange that may require an adapter for use with some transmissions. Quite simply, the LSX454R drag racing engine is the most powerful crate engine ever from Chevrolet Performance – and it’s designed to do one thing: help you win races with great durability. For the record, this 13.1:1, naturally aspirated and single Dominator-fed big-inch LS engine is officially rated at 776 horsepower at a 7,000 rpm and 649 lb.-ft. of torque at 5,100 rpm. It breathes through our high-flow LSX DR six-bolt cylinder heads that have 313cc intake runners. More than power, this engine was built for durability. Its bottom end includes our tough LSX Bowtie cylinder block and it’s filled with an all-forged rotating assembly. During development, engineers simulated the equivalent of 600 back-to-back drag strip passes on the engine dyno, ensuring it would stand up to years of performance without the need for major maintenance. It’s an engine you can depend on to go round after round, season after season! This LS3-based Racing Engine Is A Lightweight Powerhouse! 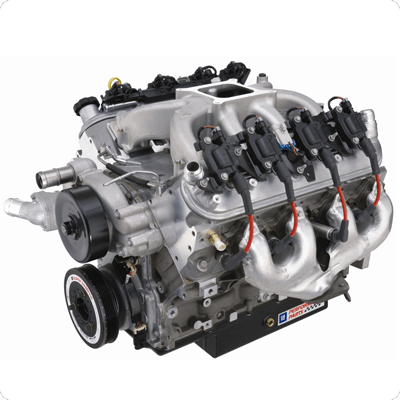 Chevrolet Performance’s deep-breathing, high-revving CT525 6.2L crate engine is based on the LS engine family and delivers serious power for serious racing series, including Super Late Model and modifieds. It is similar to the 6.2L LS3, but we’ve adapted it to circle track racing with a carbureted intake manifold, 6-quart racing oil pan and more. The engine is lightweight and strong, using an aluminum block with cross-bolted 6-bolt main caps and high-flow LS3 rectangular-port cylinder heads. This combination produces 533 hp at 6,600 rpm and a hefty 477 lb.-ft. of torque at 5,200 rpm. The CT525 6.2L comes with coil-on-plug ignition, and an SFI-certified balancer. All that’s needed to complete the assembly is a carburetor, starter and our LSX ignition controller P/N 19171130 – all available from Davis GMC Buick, Medicine Hat.